Capacity of tablet coating machine is calculated by brim volume of the coating pan and the bulk density of the tablets. The quantity of tablets used for coating in coating pan plays a great role in getting good coating results. The capacity of the coating machine pan should be calculated to get a uniform coating. Inadequate quantity of tablets used for coating in the pan may cause different coating problems. The working capacity of the coating machine is determined by the brim volume of the coating pan. Brim volume is the total volume of the water when the pan is fully filled at its current position. Brim volume is different from the total volume of the pan. Brim volume is given in the equipment manual. Maximum capacity of the pan is calculated by the brim volume and the bulk density of the tablets. It is simply determined that how much tablets are required to fill the pan up to the brim. The minimum capacity of the coating pan is simply 60% of the maximum capacity calculated above. 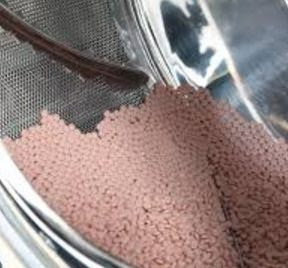 The maximum and minimum capacity of the coating machine depends upon the size and shape of the tablets because bulk density changes when the shape and size of the tablets change. Small tablets of the same formulation have higher bulk density than the big tablets. Very very good information. I don't know before it! thanks, further please add calculation of brim volume and scaleup aspects in coating. One thing is not cleared that in formulae for calculating coatig pan capicity BULK DENSITY of tab.is given in mg/ml.while in example calculation, it is in g/ml.please make it clear which one is right.